WRENTHAM, Mass. 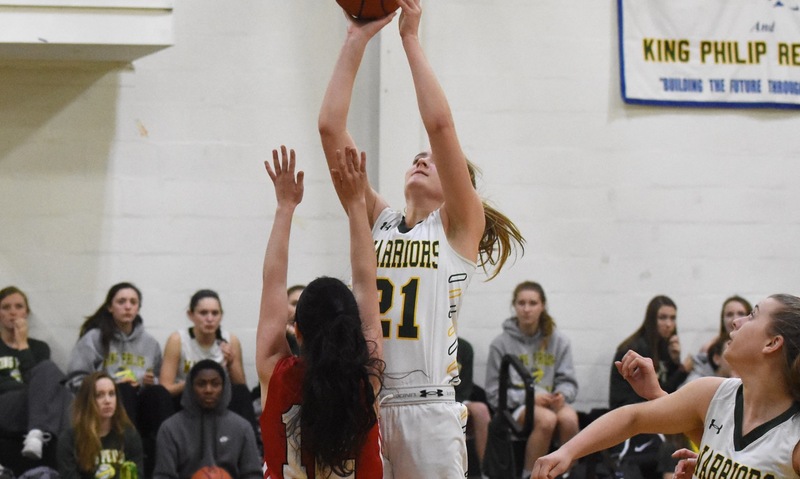 – King Philip took control of the game from the opening tip, starting the game on a 20-4 run, and with Milford still hanging around at halftime, the Warriors put the game away by starting the third quarter with an 18-4 run that ensured there would be no comeback for the Hawks. Riding those quick starts, King Philip took home a 79-39 victory that moves the Warriors back over .500 on the season and was a good bounce back from the team’s struggles against Franklin last time out. Faye Veilleux was KP’s leading scorer for the second straight game, as she scored 11 of the Warriors 22 in the first quarter on her way to a game-high 25 points. The junior forward has established herself as a consistent scorer, who can take the pressure off senior Shannon O’Connor (six points and three assists) while she is battling an early season injury. The Warriors got off to a running start, pushing the tempo and using the team’s speed to its advantage. Veilleux got out on the break a couple of times in the first quarter and senior Julia Leroux (nine points) knocked down a three in transition. Veilleux made it 20-4 by grabbing a defensive rebound and racing forward for a layup on the opposite end (plus a foul). 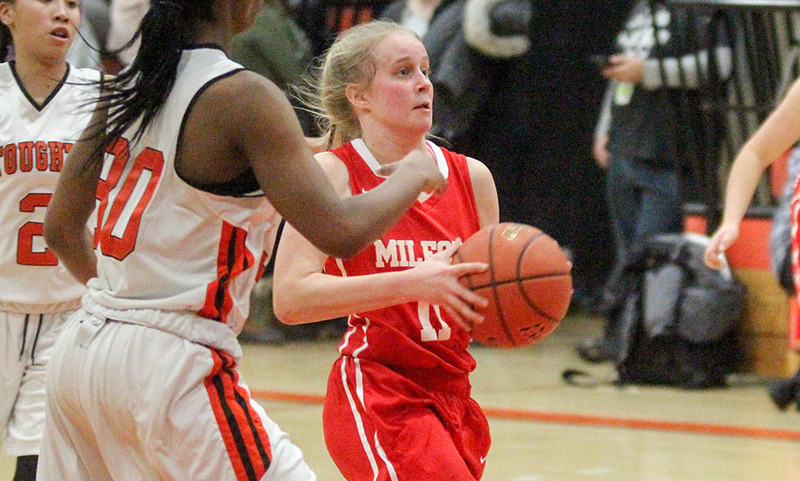 Milford did claw its way back into the game behind sophomore guard Emma Lawrence. A steal led directly to a layup and then she buried a three to cut the KP lead to 13 (22-9) after one. She continued that momentum into the second, banking home another three to make it a 10-point game. She scored 12 of her team-high 24 in the second quarter. KP’s offense continued to click, as the Warriors dominated the glass and continued to have success in transition. Veilleux scored six, including a layup off a dribble drive and underhand dish by Brianna James (four assists), O’Connor scored four, and Courtney Keswick buried a pair from beyond the arc. The Warriors scored 22 in each quarter and led by 21 at the half, despite 19 points from Lawrence. There was no let up at all coming out of halftime, as KP built an insurmountable lead with an 18-4 run. Veilleux was at the heart of things again with eight points in the third. She scored on a great feed by forward Catherine Cummings, another off a feed from Emma Glaser, and then another layup following a steal. Leroux also came out aggressive, scoring off a steal and then burying her second three of the night. The Hawks were getting offense off the dribble, getting to the basket and creating opportunities at the free throw line. Milford shot 24 free throws and made 17 of them. Lawrence was 10-of-12 at the line. 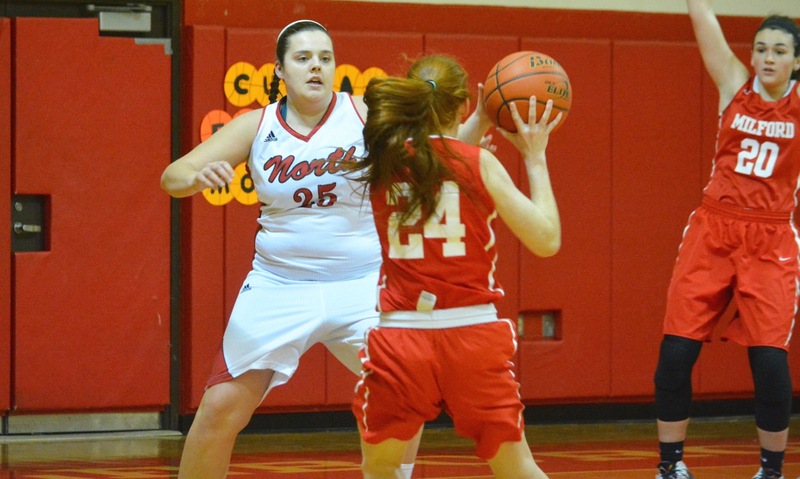 In the fourth quarter, Jillian Michelson helped out her classmate by taking the ball to the rim and creating good looks. Michelson scored all six of her points in the fourth. KP kept finding the range from deep in the fourth, as Keswick (nine points) made her third of the game and junior Nicki Lovenbury came off the bench to knock down a pair, while Cummings (six points) scored four in the paint. King Philip (2-1) will step out of the Hock on Sunday when it makes the trip to Dartmouth. Milford (0-3) has a 10-day break before it is back on the court against Hopedale. PROVIDENCE, R.I. – Coming into a game, Foxboro opponents know that they have to try and contain the Warriors leading scorer Ashley Sampson. The offense flows through the junior guard, who always seems to have the ball in her hands and can make plays in a number of different ways. While stopping one player is hard enough, the challenge grows when the other players find the range as well. On Saturday morning at the Dunkin’ Donuts Center in Providence, Milford struggled to contain a Foxboro attack that was spearheaded by junior forward Grace Tamulionis, who scored a game- (and career-) high 20 points to go along with eight rebounds and four steals. 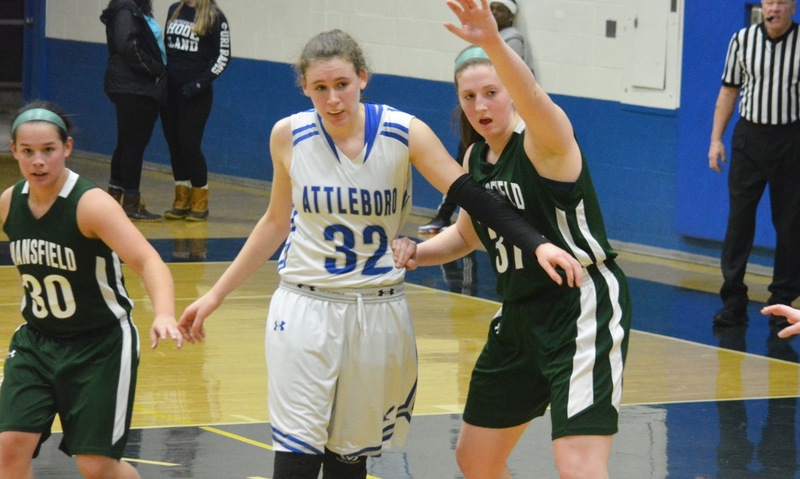 Foxboro had three scorers reach double digits and eight players get on the board on Saturday to beat Milford 66-37 and pull into a first place tie with North Attleboro atop the Davenport division standings. 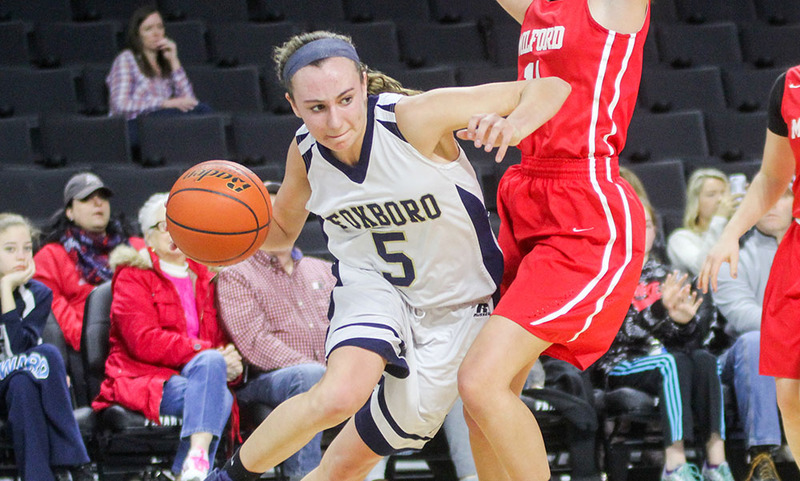 Foxboro came out firing in the first quarter and Sampson led the way with eight of her 16 points. Three times Sampson got to the baseline on drives to the hoop and she also knocked down a step-back jumper. Tamulionis also looked up for it from the start with four points in the first. Milford stayed close largely thanks to Jill Burley. After Riley Collins drilled a three off a Lauren Flahive assist to push the Foxboro lead to nine, Burley, who scored seven of her 11 in the quarter, scored on a pair of drives to the hoop to cut the deficit to five despite leading scorer Kate Irwin being forced to the bench with foul trouble. In the second, Emma Liskov came off the bench to score five of her team-high 13 points to keep Milford hanging around, but Foxboro was able to push the lead to nine by the break. Shannon Smally scored her lone basket to make it 22-15 and then Flahive and Kristen Bortolotti (from a Lily Sykes steal and assist) scored the final four points of the half. In the third quarter, Milford was held to only two made field goals (one for Liskov and the other for Christine Pye) and Foxboro’s defense continued to shut down Irwin, who was held to just one point for the game. On the other end, Tamulionis emerged as the go-to player for the Foxboro offense. She scored 10 points in the third, including a pair of threes, and looked confident every time she touched the ball. 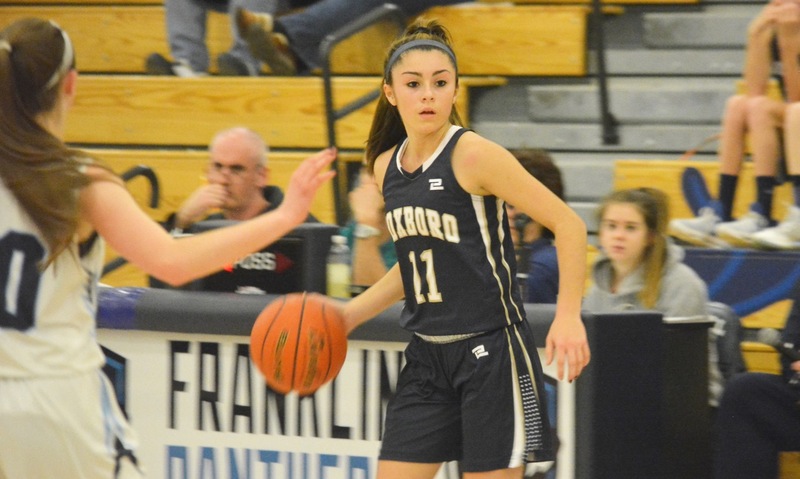 Sykes (12 points) extended the lead to 20 with a pair of high-arcing three-pointers of her own that closed out the third with Foxboro ahead 47-27. “Grace has been doing some amazing things defensively and on the boards and now to have her being able to put the points on the board is just an extra bonus that’s going to get us far,” said Downs of Tamulionis’ contributions. Sampson scored four in the fourth quarter, Sykes added six, Collins knocked down a three, and Tamulionis hit a jumper as well. Milford was struggling to slow down the Warriors, who were shooting the lights out. Foxboro (9-2, 8-2) is now tied with North Attleboro for first in the division heading into a tough trip to Attleboro on Tuesday. Milford (8-5, 5-5) drops to .500 in the league this season and faces a trip to Kelley-Rex leader Mansfield. STOUGHTON, Mass. – There are a lot of things that TJ Dolliver wants his Scarlet Hawks to accomplish over the course of a game. Getting off to a strong start is near the top of that list. 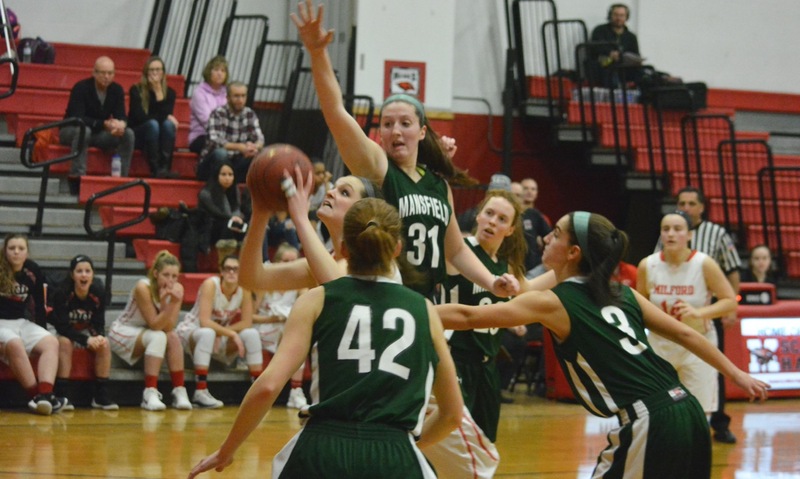 Milford did just that, limiting Stoughton to just four points in the opening quarter and built on that advantage over the next three quarters for a 51-37 win on the road. 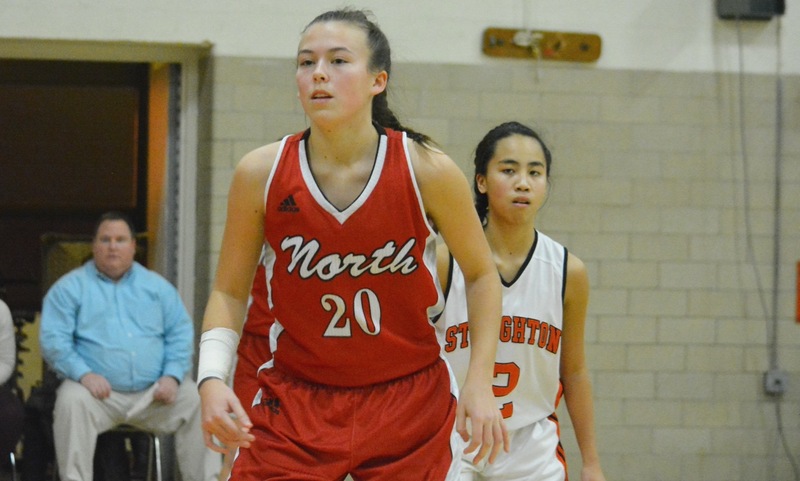 Christine Pye got things going early for the Scarlet Hawks, netting six of her seven points in the opening quarter. 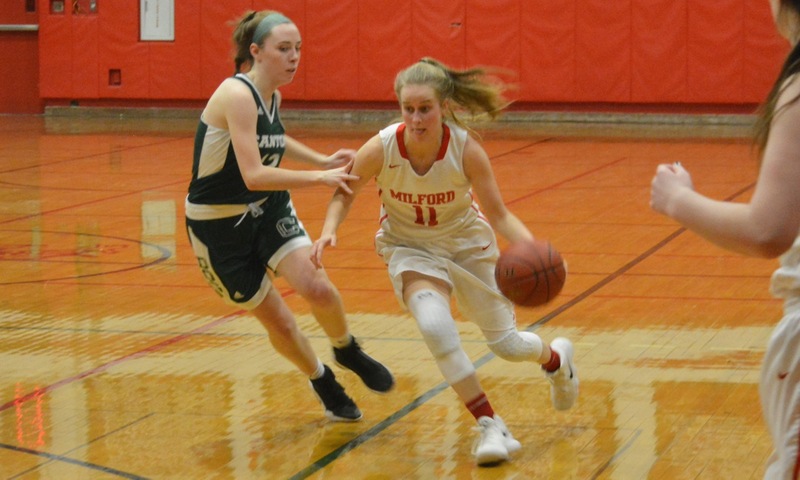 Kate Irwin, who had a four point play in the first quarter, paced Milford with a career-high 27 points. Scoring from Pye and Irwin paced Milford’s offense early on while its defense blanked Stoughton for over six minutes. The Black Knights were able to finally break through with a free throw from Val Whalen (11 points, 10 rebounds) but the Scarlet Hawks held a 12-4 lead after eight minutes. Stoughton got within six points halfway through the second quarter after a pair of free throws from Jordan Motley (15 rebounds) but Milford came back with an answer. Over the next four minutes, the Scarlet Hawks hit a trio of trifectas – one each from Nicole Dahlgren (six points, seven rebounds), Irwin and Jess Tomaso – and scored 12 points total to take a 27-16 lead into halftime. Milford kept its 10 point cushion throughout the third quarter, coming back with an answer anytime Stoughton scored. 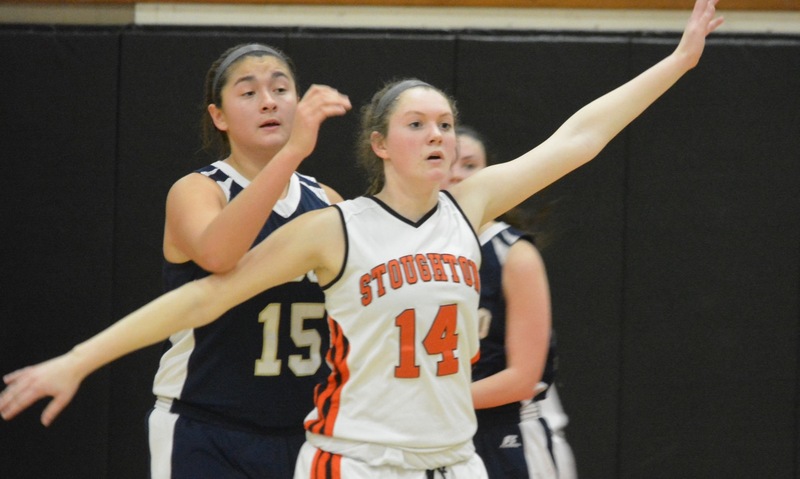 Stoughton freshman Aliyah Wright (12 points) drained a three late in the third to cut it to eight but Milford’s Emily Piergustavo converted an offensive rebound on the ensuing possession. Wright scored again to make it single digits but a traditional three point play from Irwin put the lead back to 11. Irwin scored nine of her 27 points in the third quarter and added five more in the final frame to help the Scarlet Hawks ice the game. “She’s done a really good job of increasing her intensity,” Dolliver said of Irwin. “She’s evolved as a point guard over the last two years. One big focus point was getting her to take better shots. She’s taking less shots this year but averaging twice as many points this year. Milford girls basketball (5-1 overall, 3-1 Hockomock) is back in action next week when it travels to Canton on Tuesday. Stoughton (1-5, 0-4) will be back in action on the same day with a trip to Foxboro.